So it was with some sense of history that we sat and reflected on Music and Literature and enjoyed the view up and down the Thames. We knew that Frank Bridge mulled over his great tone poem Summer near here and of course across the river in Barnes are to be found the one-time homes of Sir Arthur Bliss, Herbert Howells and William Blezard. But perhaps it is with Gustav Holst that most musical people associate Hammersmith. So we drank up our bitter and wine, took a couple of �snaps� of the river and headed back towards the famous bridge. 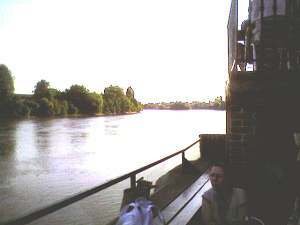 Our next stop was the Blue Anchor � a small pub that is about as close to the river as you can get. My only problem with this hostelry is the plastic beer �glasses� issued for use outside � so inside it was. There is a definite �rowing fraternity� feel in this pub, and I imagine that it is virtually impossible to get a drink on boat-race day. The pub itself has starred in a number of screen productions including the film Sliding Doors and made a cameo appearance in the great TV series Minder. Yet it is for Gustav Holst that we came here. A web page review states that "Holst wrote some old bit of music here" and we needed to investigate. Fortunately the notice board in the doorway gives us all the information we required � or did it? Read carefully - "Gustave Holst wrote his Hammersmith Suite within this pub." Now I am not a learned authority on the music of Holst, but I do pride myself on knowing most of his orchestral music. One of my earliest introductions to his work was the St Paul�s Suite, written for the eponymous girl�s school just up the road from the Blue Anchor. And of course I have known the Hammersmith Prelude and Scherzo in its orchestral and wind band versions for years more than I care to recall. But the Hammersmith Suite? Gustav Holst had taken up residence on the other side of the river - you can still see the house where he lived - in a rather lovely situation close to Barnes Bridge Station. He lived there for some forty years. In 1904 he was appointed as the Musical Director at St Paul�s Girls School across the river in Hammersmith. It was a journey he must have made many times as he kept that post until his death in 1934. It is well known that he had a sound-proof room built at the school specifically for his personal use in teaching and composing. Nearly all the music of the last three decades of his life was written there. Now back to the notice board at the Blue Anchor. Holst�s first composition as head of music was the St Paul�s Suite, composed in 1913. This was a somewhat �flexible� work that was composed originally for strings but had a number of wind parts added in the event of a bigger orchestra being available. The �Suite� is in four movements � a Jig, an Ostinato, an Intermezzo and the well known Dargason. This last movement was an arrangement of the final movement of the earlier Second Suite for Wind Band of 1911. Look out for the clever use of the wonderful old tune Greensleeves. But good and local as this music is I guess that this is not the work alluded to in the pub sign. It goes without saying that the notice-board was not referring to the Moorside Suite. This attractive and perhaps little known work was composed for the BBC and the National Brass Band Festival Committee. Especially worthy of note is the lovely �Nocturne.� It has been said that this music has the tenderness and warmth that seemed to elude Holst for most of his life and perhaps heralded a new dawn for his music. The first movement is a scherzo - it is perhaps less of a �joke� than a musical portrayal of a walking trip over the downs with RVW. The last movement nods towards the famous �Marching Song�. For the record, this suite has been arranged for strings by Gordon Jacob and is perhaps equally as impressive as the �brass� original. But we decided that this was not the work alluded to. There are precious few bits of moorland near Hammersmith. The last �suite� that sprang to our minds was the thoroughly enjoyable Brook Green Suite written in 1933. It was composed whilst the composer was in hospital with stomach problems and was written for the junior girls at St Paul�s School. The story goes that Holst wished to write a piece that reflected the �modern idiom� yet was not beyond the ability of the pupils. It was certainly not a condescending work as even the most cursory hearing will confirm. But it is well written and does not present insurmountable technical difficulties. It has been suggested that Holst named the work �Brook Green� because a) it was close to the school or b) because he was married nearby. Sadly the first performance of this work was the very last concert that Holst attended. Holst re-scored the work for full orchestra and it was this version that was premièred in London in 1931. Apparently it did not go down too well and was booed. I must confess that our glass of Pinot Grigiot and pint of �Best� did go down well and it was with some difficulty that we dragged ourselves away from the Blue Anchor. The enigma was solved. An error of musical history had seemingly invented a �new� work which had all the potential for an interesting discovery. But I suppose we were never really in doubt as to which composition the sign referred to. However it passed an interesting hour for us - reflecting on the some of the best of this great composer�s music in one of the most evocative parts of London. And one last thing: look at the picture - the composer�s Christian name is spelt Gustave! 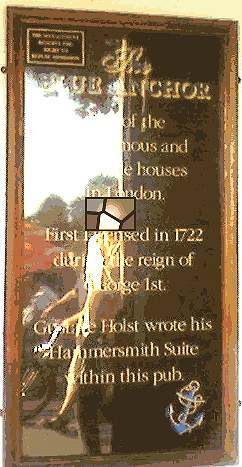 We cognoscenti know it was actually Gustavus Theodore von Holst � or just plain Gustav. Please paste in the first line of your comments the URL of the review to which you refer.